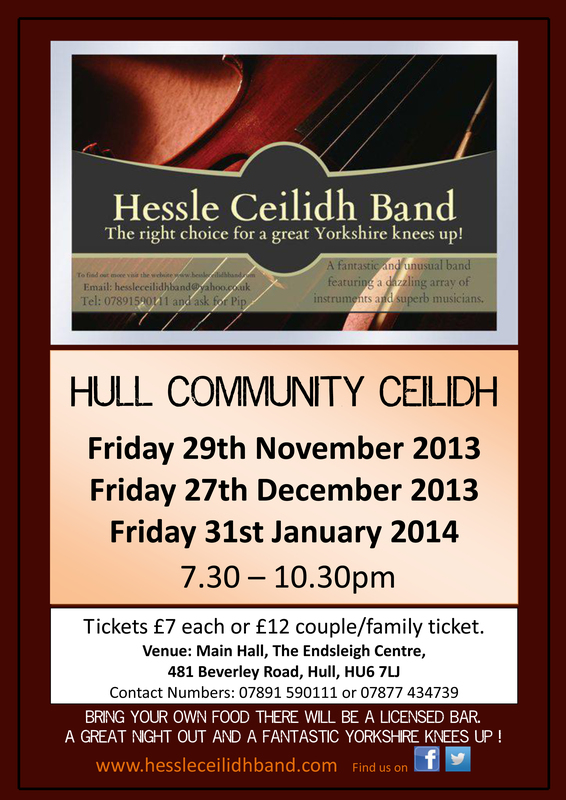 The event features music from The Hessle Ceilidh Band who are a popular dance band based in the East Riding of Yorkshire. They are a five piece band including a dance caller, they play whistle, fiddles, recorders, melodeon, guitar, piano, bagpipes, hurdy-gurdy, various percussion and shawms. Their Ceilidhs are vibrant and fun in fact a right good Yorkshire knees up! Tickets are available on the door priced at £7 each or £12 couple/family ticket. To reserve tickets or for further information Ring Quentin on 07877434739. ‘ For us, it doesn’t matter if you are familiar with ceilidh (or folk or other social) dancing or if you’ve never danced before or you don’t have a partner, we would love you just to come and enjoy our dances. This is dancing for fun and good company.